Bohemian Switzerland, located in the Czech Republic (! 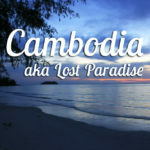 ), is a little-explored gem. Almost unknown to travellers (and even more so to tourists! 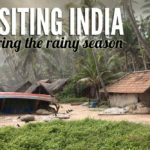 ), it’s an oasis of greenery in the Northern tip of the country. 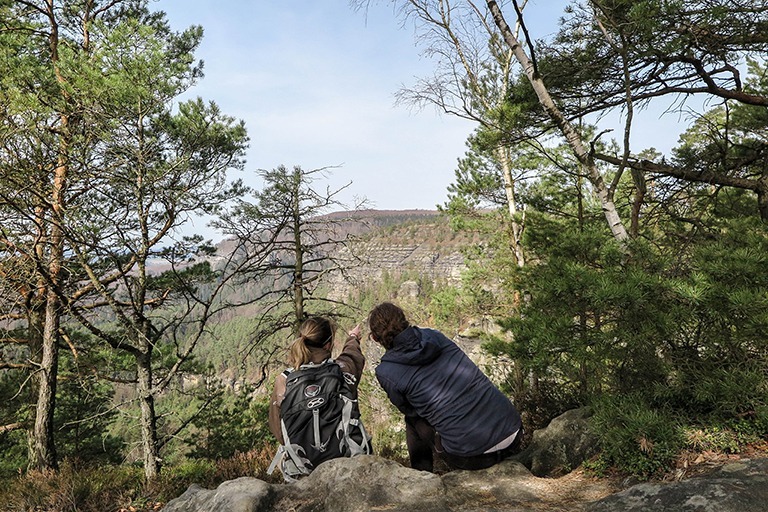 Here are some highlights of the incredible views you can have when going on a hike there. 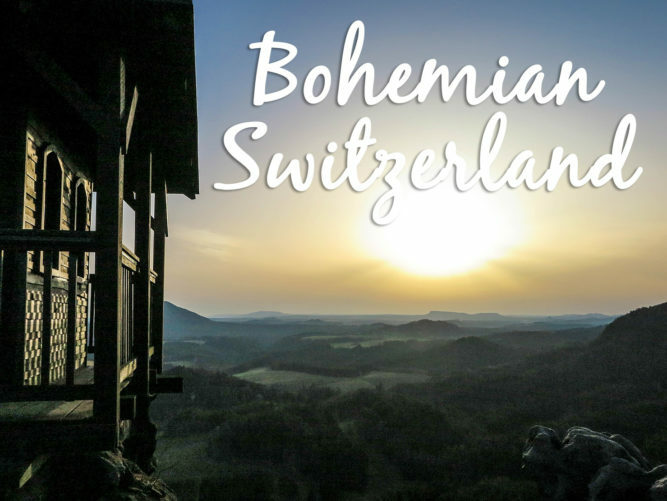 I’ll cover some practicalities of visiting the National Park of Bohemian Switzerland in another post. Now it’s about the beauty of the landscapes and the awe-inspiring views! This post wouldn’t have been possible without friends at Northern Hikes, expert friendly guides who are natives to the area and can take you where ordinary trails wouldn’t. 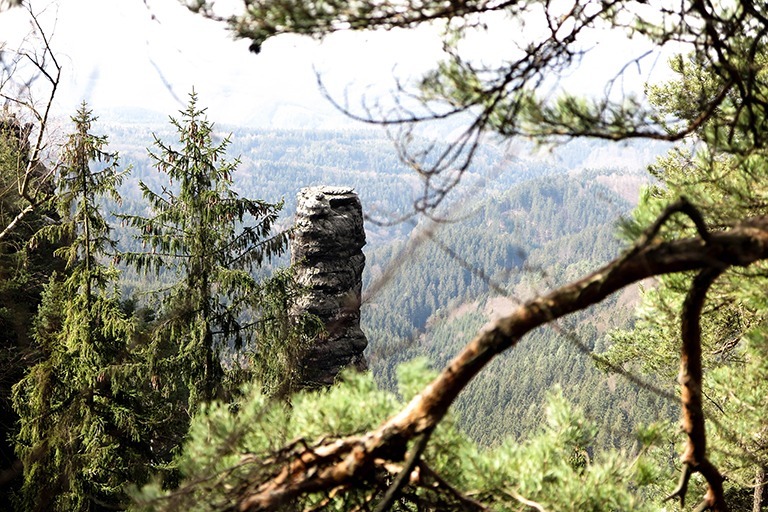 This little rock castle carved into a piece of sandstone definitely lies off the beaten path. If you don’t know the exact trail, you might never find it. The former castle from the 14th century is essentially just a ruin today. Long gone are the days when the castle had an important role of overseeing a part of a merchant route that led nearby between Germany and the Czech land. Legend has it that bandits took over, which led to abandoning of the merchant route and the rock castle altogether. Till this day, though, Šaunštejn is sometimes referred to as Bandits’ Keep. You can climb to the very top of it, on alternating stairs and ladders. It’s not for the faint-hearted! To get to the top, you need to climb a ladder that goes in a crack in the rock. Big backpacks and gear are a no-go. Once up there, though, you’ll see that it was worth all the effort. The views are breathtaking. It’s rough, it’s windy, and either empty or only with a few locals. Šaunštejn is definitely worth a visit. It doesn’t happen often that a cultural heritage site would be so open to public and free to explore on your own. It starts pretty steep, but believe me, all worth it! Michal from justapack.com on the photo. You should always keep looking around – even the views from the first ladder are nice! 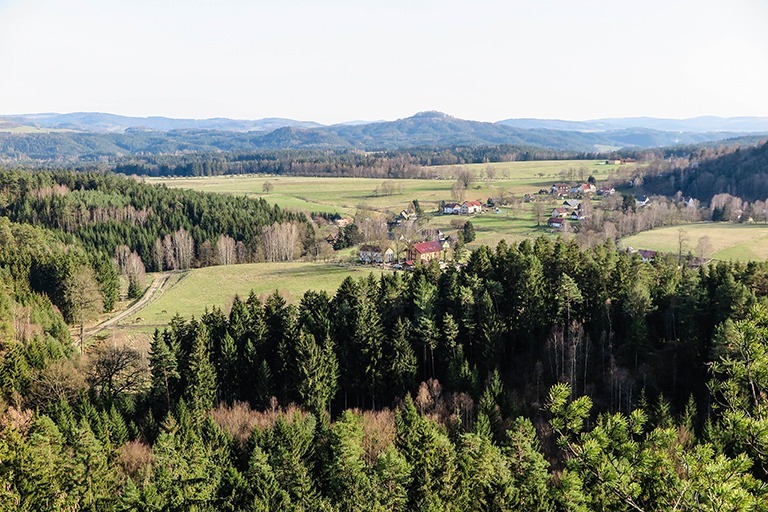 Beautiful views from Šaunštejn: a village of Vysoká Lípa, with forests and fields all around. It helps to be fit to hike up to Mary’s Rock. The 240 steps that lead to the top of the sandstone hill guarantee a strenuous hike, especially if you’re in a hurry to catch the sunset! Once you tackle the last flight of stairs and enter the beautifully carved wooden gazebo, you’ll be rewarded with an incredible view. It feels almost as if you were on top of the world. The wind will try to convince you so, and it will only add to the experience. 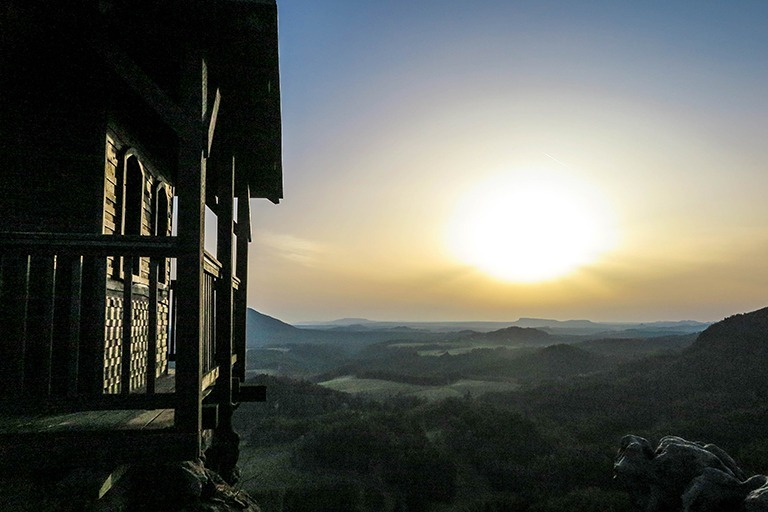 Having served since 1856 as a fire watchtower for the village Jetřichovice lying just below, the top of the hill used to have only a basic shelter. Gradually, a small wooden hut was built atop. Ironically, the original wooden hut burned down in 2005 due to negligence. Already in 2006, though, a new gazebo was put up. Don’t you think it’s worth to hurry up there to Mary’s Rock for the sunset? Sunset above the mountains.. does it beat the beach sunset for you? 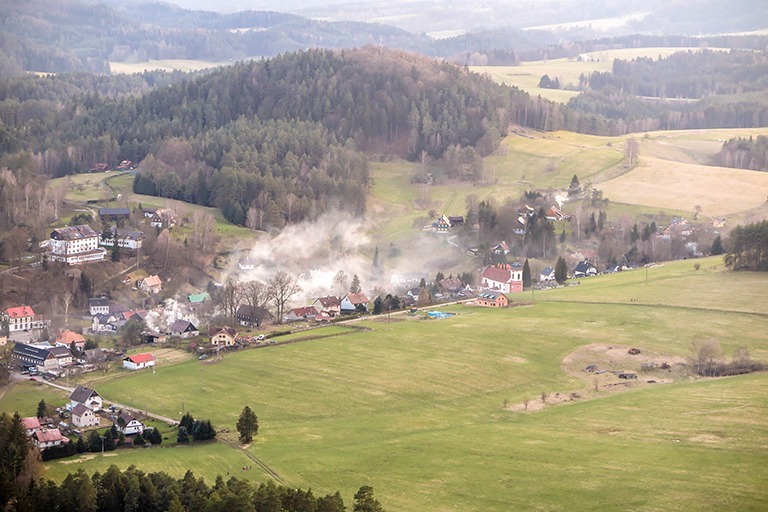 The gazebo was built to guard the village of Jetrichovice from burning down in a fire. Like that time when we visited! The views are out of this world! 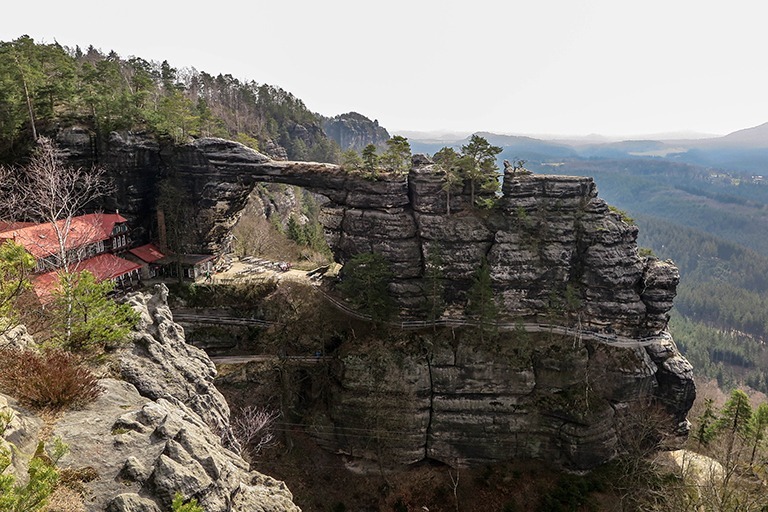 This is the real star of them all and at the same time an official symbol of Bohemian Switzerland. 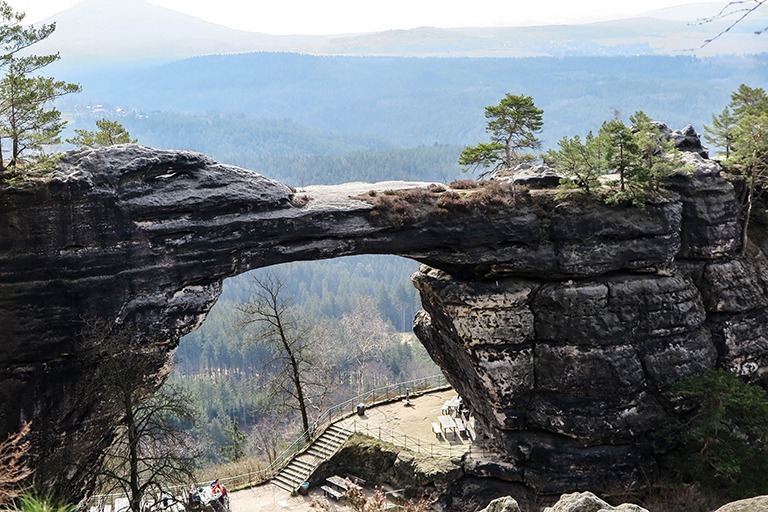 A special narrow rock formation in the sandstone, the Pravčická Gate has been the main reason for trips to the area for centuries. Just look at how pretty it is! The Pravčická Brána, as it’s known in Czech, is 27 metres wide and 15m tall. 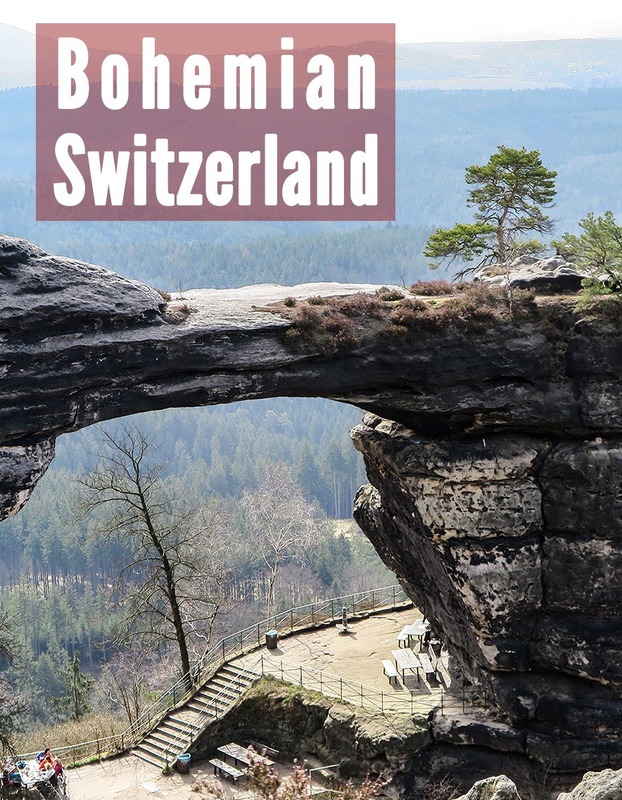 It’s a unique rock formation, in size the largest natural rock arch in Europe. On a bright day, you can see as far as Germany! The beautiful look of the Gate wouldn’t be complete without the architectural pearl decorating it. 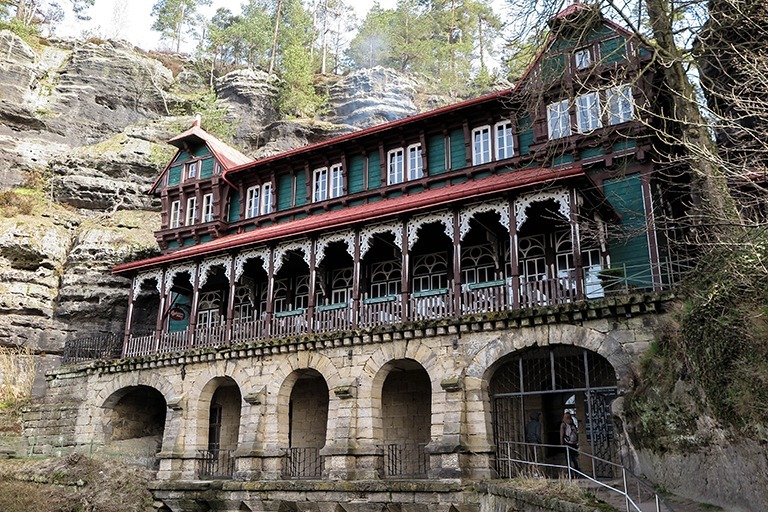 Sokolí hnízdo, or Falcon’s Nest, was built in 1881 as a hotel for affluent guests by a local nobleman of Austro-Hungarian origin, Edmund Clary Aldringen. You know, in 19th century, travel was a privilege only the richest could enjoy. How lucky we are today! If you’re still not convinced the Gate is so special, just hear this: It made it to the Chronicles of Narnia! You have to pay a small entrance fee to admire this unique natural gem. There are many paths leading to various viewpoints, from which you can see the Gate and the green surroundings. You cannot walk on the Gate itself, as the sandstone is quite sensitive to erosion. A few decades of tourists walking on it since the end of the 18th century damaged it enough. In 1982 the last few have walked on the rock when small tears in the rock were found and an entry ban was introduced. 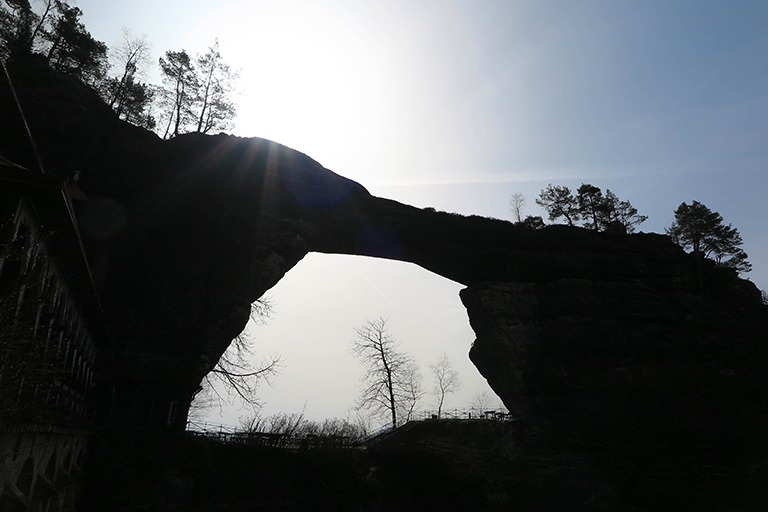 One day, in a hundred thousand years or so, the Pravčická Gate will collapse – it’s just the nature of the sandstone. So you better go see it while it still stands there in all its glory! Falcon’s Nest – it doesn’t serve as a hotel anymore, but I’d totally stay there! Pravčická Gate in all its glory. You can go sit down underneath but it’s windy! Unfortunately you can’t see it so well from my photos, but the views from Belvedere lookout point were indeed charming! 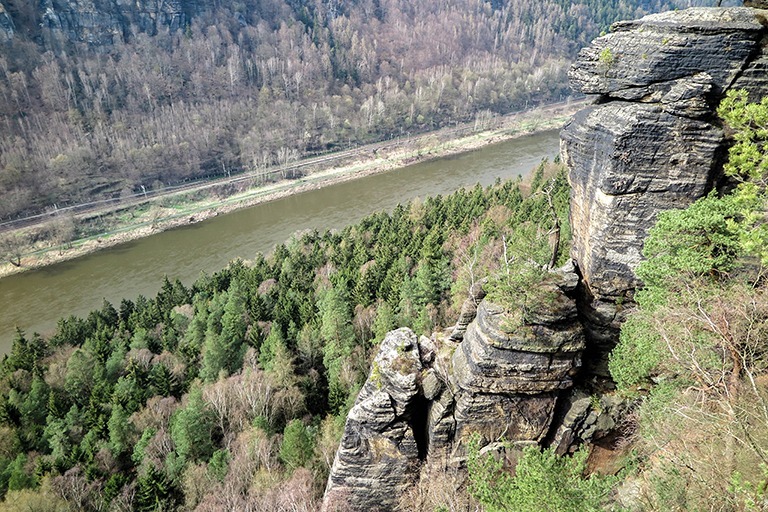 You could see the Elbe River Canyon from there, as it rises just 130 metres above it. When the weather’s on your side, you can enjoy scenic views and glittering sunshine on the river’s surface. 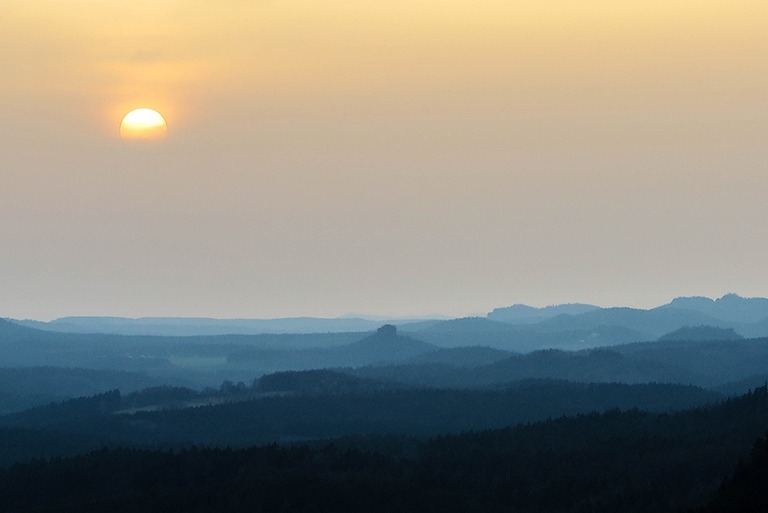 The table mountains, which you can spot across from the river on the German side, are Zirkelstein and Kaiserkrone. Belvedere viewpoint plateau was carved into the sandstone around 140 years ago. 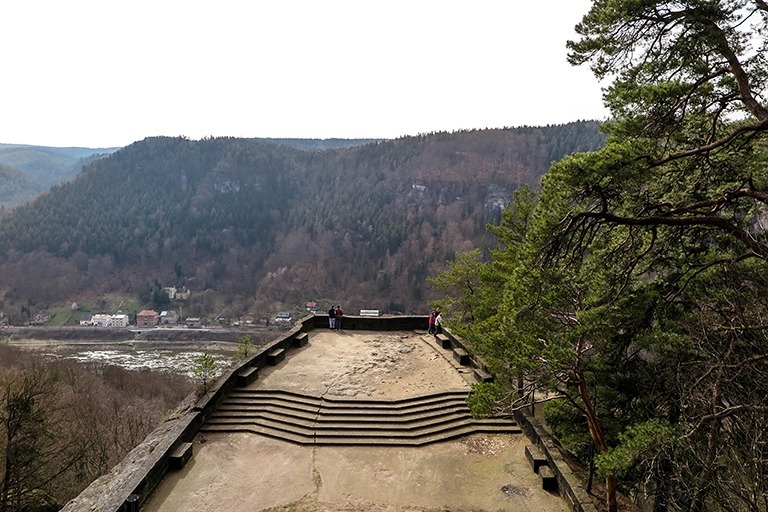 That makes it actually the oldest viewpoint of Bohemian Switzerland. Again, the highly influential Clary Aldringen family is behind this unique viewing spot. The family had their hunting chateau here and they’d use the site for classical concerts. They were friends with Beethoven, after all! Belvedere concert hall – this is where the noble families would listen to classical music. 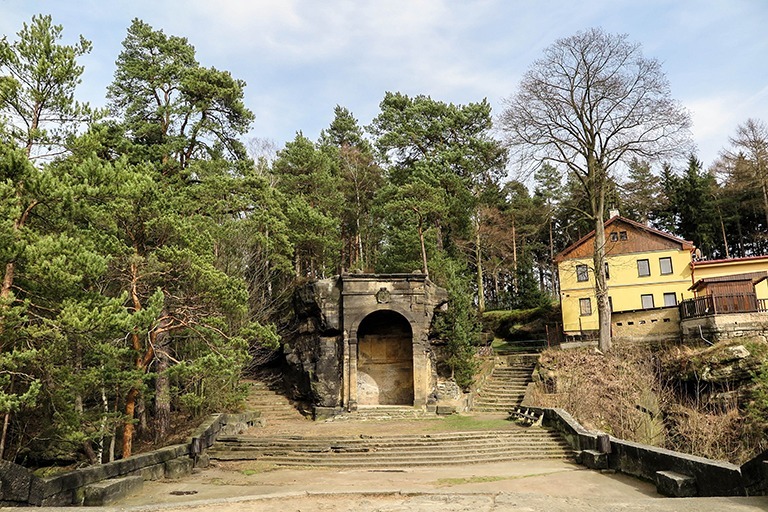 Belvedere viewing platform – as old as 140 years! Views from Belvedere – as you can see, they change according to season! 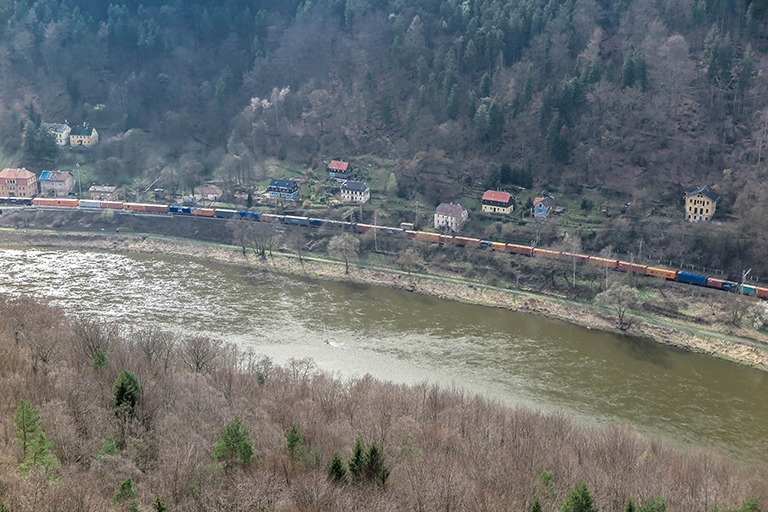 If you’re lucky, you might even see a train pass by along the Elbe River. 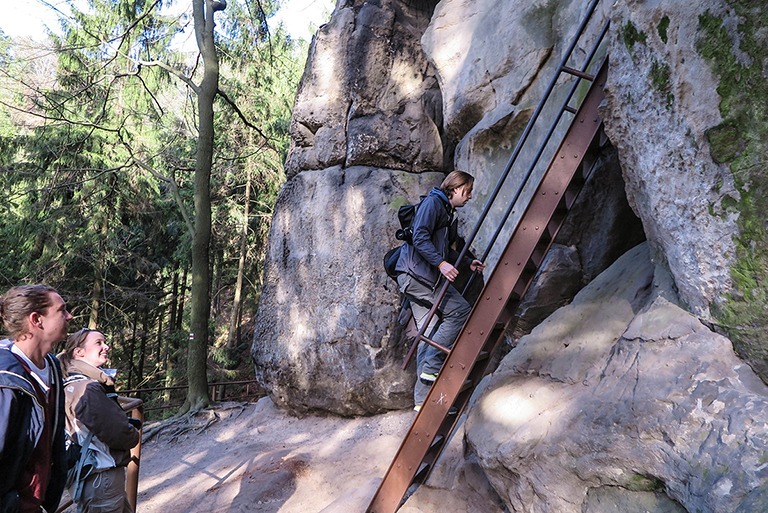 As mentioned already above, I explored Bohemian Switzerland with Northern Hikes. I enjoyed the trip a lot and felt like Vitek, the company owner, became a real friend. That’s why I arranged a 10% discount for you, my dear readers. 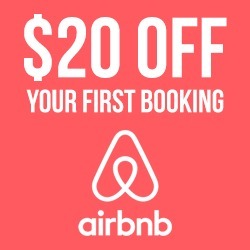 Check how to get your discount here. 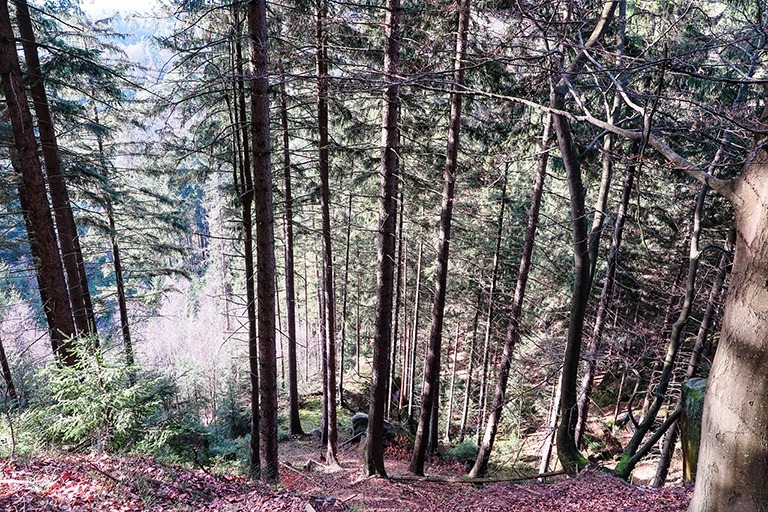 Have you hiked somewhere this pretty? 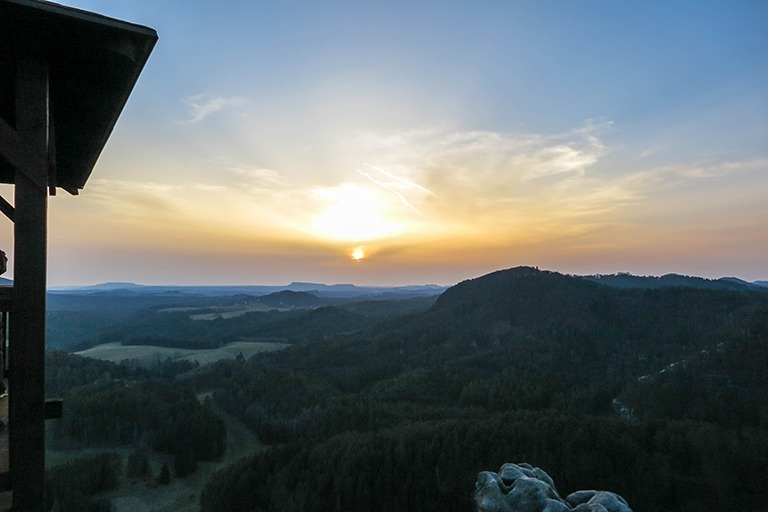 Did you just put Bohemian Switzerland on your bucket list? 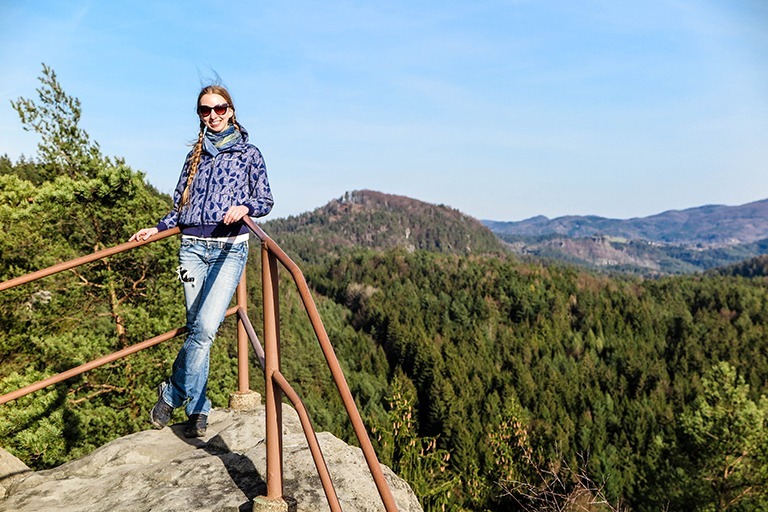 Disclosure: Veronika of TravelGeekery was able to discover Bohemian Switzerland thanks to Northern Hikes. All opinions are Veronika’s own and unbiased. 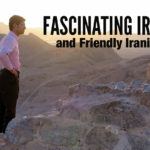 Travelling to Iran: What to Wear?Forget Golden Circle. Go to Snaefellsness Peninsula instead! Wow, what a beautiful hike! Loving the pictures! 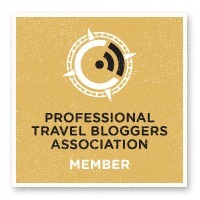 Good to hear that Czech Republic has natural highlights … want to see more in that nation than just Prague! Hi, I was wondering if you did this hike all by yourself or you went with Northern Hikes? Appreciate if you could let me know as I am planning on doing the hikes myself because their prices are a bit steep for me. Hi E, I went with Northern Hikes. It was the easiest to get around with them. And I would recommend Northern Hikes very much. Btw. people rarely speak English there, the region hasn’t developed to that standard just yet. 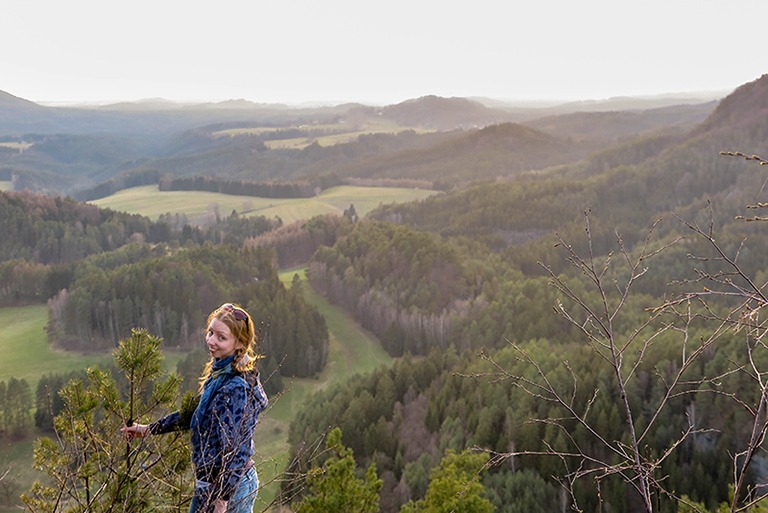 Nice spot in the Czech Republic … looks like a great second place to go after Prague! Wow – you made it up to Mary’s Rock – kudos to you for your stamina! 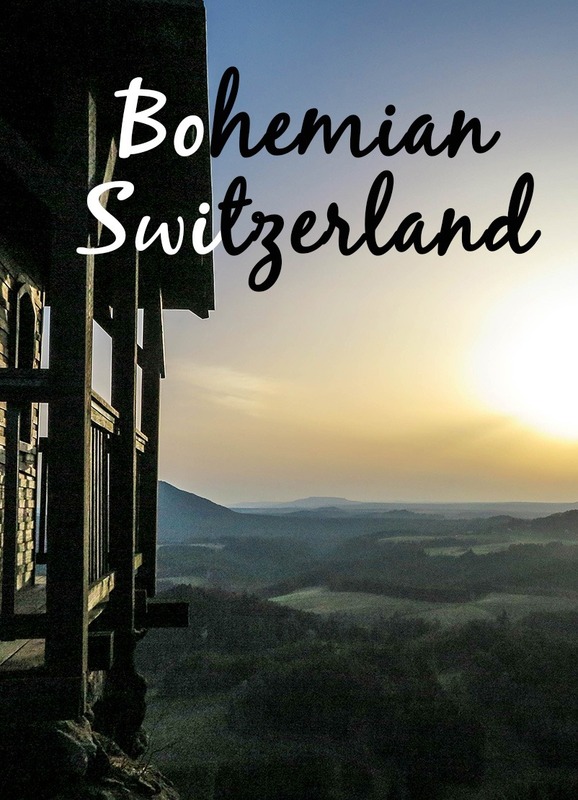 We spent 2 days in Bohemian Switzerland and it was SO worth it. 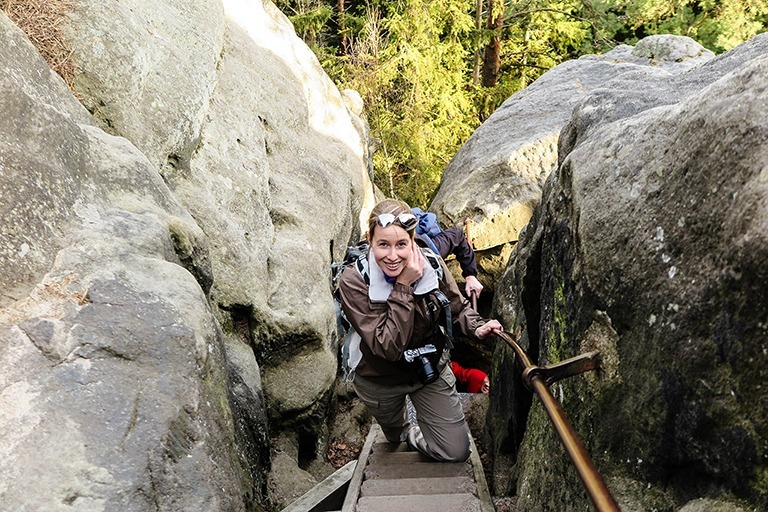 We used Northern Hikes, too. They took us to the best sites and chose routes that we could hike without needing special shoes. Sometimes it pays to hire a guide.